Rev. Gerald J. Leahy, CSV, died at St. Joseph Home in Palatine on Christmas evening, 1993 at 8:00 p.m. He was 70 years old. A native of Chicago, Gerry Leahy was born on January 19, 1923. After graduation from St. Mel High School in Chicago and two years of college at St. Philip College in Milwaukee, Gerry Leahy joined the Viatorian novitiate in Bourbonnais on August 15, 1944. 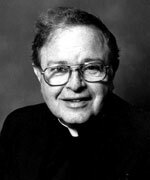 He pronounced his First Vows on September 13, 1945 and then continued his undergraduate studies at St. Ambrose where he graduated in 1947. After theological studies at St. Thomas Seminary in Denver, he was ordained to the priesthood on May 20, 1951 by Bishop Bernard Shiel. Gerry then began a life long career of high school teaching, almost completely spent in his beloved Springfield at Cathedral Boys High School and Griffin High School. From 1951 to 1984 Gerry was involved in the educational ministry of the Province; the countless number of lives touched by his gentle spirit and personal concern is legend in Springfield. After a year’s sabbatical in 1984, he moved to the Province Center to be Director at the Residence wing. In late 1988 he suffered a major stroke and had been in residence at St. Joseph Home since early 1989. Visitation was held at St. Joseph Home, 80 West Northwest Highway, Palatine, on Tuesday, December 28, 1993 from 4:30 p.m. to 8:00 p.m.; a Liturgical Prayer Service was held at 8:00 p.m. The Mass of Christian Burial was celebrated at St. Joseph Home on Wednesday, December 29, 1993 at 11:00 a.m. Burial was in the Community Plot at Queen of Heaven Cemetery. Father Leahy is survived by his sister, Mrs. Ellen Lewis. Father Leahy was preceded in death by his sister, Nora Ann, and two brothers, Edward and William. Remember Father Leahy in your prayers and gather together in local communities to remember him in Eucharist. Taken from letter to the Viatorian Community on December 27, 1993 from the Provincial, Rev. 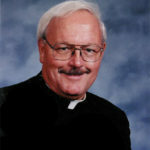 Robert M. Egan, CSV.